Of the 20,000 animals who’ve crossed Nina Stively’s path in her years as Outreach Manager at the Espanola Valley Humane Society (EVHS), only two have struck her as a very particular type of extraordinary. Rio, an adult intact male of Pit Bull-ish pedigree, was one of them. Rio: nothing special to look at? He was also smart, appropriately confident, and exceptionally toy motivated — a trait prized in specialty training. Nina recognized his potential: This animal is an excellent candidate for search and rescue work. 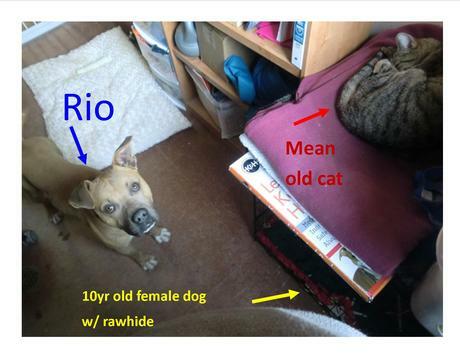 And for dogs like Rio, whose age and appearance don’t necessarily bode speedy adoptions, Nina knew that promoting him as a rare find might just be a quick ticket out. Nina contacted the local search and rescue organization there in New Mexico and told them about Rio. She asked if someone from the agency might come down and evaluate him. If the shelter could publicize this dog as a one in a million discovery — as deemed by experts — adoption would be almost certain. The response shocked her: Shelter dogs are too sad to evaluate, the search and rescue organization told her. In other words, without an owner already lined up, it wasn’t worth it for the agency to spend 15 minutes observing Rio. Too much heartache if he didn’t ultimately get adopted. Nina wasn’t asking them to train this dog, merely to assess whether he might make a good candidate for the type of work they do. So she requested they reconsider, explaining that being creative with the dogs is what helps to save them. Certainly they could spare 15 minutes to simply come provide an opinion on an animal who could potentially save countless human lives. Nina completed and sent in the involved application on Rio’s behalf, including photos, detailed written descriptions, and video footage of the “sad shelter dog.” This morning, she found out Rio was accepted into the program. In addition to guaranteeing placement for Rio, no matter how he performs in the training program, AFF will pay part of the cost to get him from Espanola, New Mexico, to upstate New York. The shelter is raising the remainder of the money itself. For explicit information about what funds are needed and why, or to donate to Rio’s journey to a new life, check out his GoFundMe page. I hope the organization that declined to evaluate Rio sees this article. Because while some individuals refuse to consider shelters as anything more than a huge bummer for humans, others feel a responsibility to help homeless dogs and cats find a better life. They understand that providing opportunities for animals to leave the shelter environment translates to fewer sad dogs and cats. That turning away from a shelter actually contributes to the sadness and heartache.